It's almost been a week since the release of NEVER TOO LATE, and, yes, my head is still spinning! Today, you can find me at Romancing Rakes For the Love of Romance, where I do an interview that includes a fleeting glimpse of Book 2! 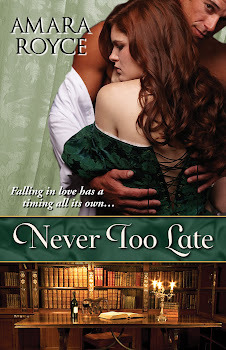 Also--a giveaway of NEVER TOO LATE! Nancy Goodman's Rakes Rogues and Romance - an interview including some of my writing influences and a bit more detail about my PhD, among other things. Book Lovers Inc - guest post about NEVER TOO LATE's heroine Honoria Duchamp and the Victorian notion of "redundant women."